"Of all the curiosities here I've seen, none could've surprised me more than this." What lover of outsider cinema doesn't have a soft spot for New World Pictures, at least before it was gobbled up by Murdoch's paragon of corporate evil, News International? Founded in 1970 by B-movie king Roger Corman, it gave birth to some of the most fondly regarded low budget American films of the 70s and helped launch a number of notable careers. Under Corman's thirteen year directorship, its output included Monte Hellman's Cockfighter, Paul Bartel's Death Race 2000, Ron Howard's Grand Theft Auto, Joe Dante's Piranha, Allan Arkush's Rock 'n' Roll High School, Barbara Peeters' Humanoids from the Deep, Jimmy T. Murakami's Battle Beyond the Stars and Aaron Lipstadt's Android. Even after Corman's departure, his instinct for a material with future cult potential lingered on. Check out this little collection from the post-Corman period: Douglas Cheek's C.H.U.D., Ken Russell's Crimes of Passion, Fritz Kiersch's Children of the Corn, Penelope Spheeris's The Boys Next Door, Paul Bartel's Lust in the Dust, Larry Cohen's The Stuff, Harley Cokeliss's Black Moon Rising, Steve Miner's House, Chuck Martinez's Nice Girls Don't Explode, Clive Barker's Hellraiser, Mark Goldblatt's Dead Heat, and Vincent Ward's The Navigator: A Medieval Odyssey. All the material you could want for a booze-assisted desert island weekend viewing, I'd say. It all came to an end in 1989 when the New World Pictures and Video divisions were shut down, a year that saw the release of two of the studio's most endearing films in the shape of Michael Lehmann's Heathers and Steve Miner's too often under-appreciated second film for the company, Warlock. Like a lot of Corman's best later works, Warlock is a mainstream audience-pleaser in B-movie clothing, a time-hopping fantasy-horror-thriller whose indie sass carries it comfortably through the occasional button pushing and narrative logic holes. It begins in 1691 Boston, where a dangerous and nameless Warlock is awaiting execution after bring caught by renowned witch-hunter Giles Redferne, but escapes with the aid of a time vortex, into which Redferne is also pulled. The pair are deposited in late 1980s Boston, where the Warlock sets out to retrieve and reassemble The Grand Grimoire, a book that contains the true name of God, which if spoken backwards has the power to undo creation. Whatever else you might say about Warlock, it doesn't hang around. Redferne and the Warlock are introduced, their relationship is established, and the time hop completed in the space of just nine minutes. A short while later we're introduced to young waitress Kassandra ("with a K") when the Warlock crashes through the window of an apartment she shares with the good-hearted Chas, who drops out of the story the following morning when the Warlock cuts off his finger (he really likes Chas's ornamental ring) and silences his screams by biting out his tongue. The police have been and gone and Kassandra's back at the apartment cramming clothes into a suitcase when Redferne bursts in looking for a sample of the Warlock's blood, alarming her enough to recall the police, who quickly disable Redferne and haul him into custody. A short while later the Warlock returns, recovers the first part of the Grimoire from an antique desk in Kassandra's apartment, and bestows on her a curse that ages her twenty years a day. Realising that Redferne may be telling the truth, Kassandra bails him out of jail and the two begin a cross-country pursuit to capture the Warlock before he reassembles Grimoire and brings the world to an end. It's to Miner and screenwriter David Twohy's credit that they resist the temptation to make a comedy of bemusement from the lead characters' three-hundred year hop through time. Both men adapt with surprising ease to their new environment, suggesting perhaps that medieval sorcery has exposed them to sights far stranger than anything twentieth century technology can offer. It's a concept neatly illustrated when, having reacted with surprise to a radio broadcast, Redferne gently mocks Kassandra's suggestion that he might believe there were little men inside of the device. Only occasionally does a lack of understanding trip Redferne up, as when he challenges police with a whip and gets floored by a Taser, though you don't have to hail from the middle ages to share his absolute horror at the prospect of aeroplane flight. The comic elements are there in Kassandra's reaction to both Redferne and her own predicament, but thankfully stop short of the wisearse norm of current teen horror, with an exchange involving Kassandra's misunderstanding of the term 'witch compass' brought to a halt before it has the chance to develop into an Abbott and Costello routine. I've seen the case made for Warlock as a polar inversion of James Cameron's 1984 The Terminator, whose dangerous antagonist is chased back through time by his would-be assassin and hunted with the assistance of an initially bemused and out-of-her depth young woman. But if you're looking for a cinematic role model then I'd offer up Nicholas Meyer's 1979 Time After Time, in which Jack the Ripper uses H.G. Wells' time machine to flee to the present day, hotly pursued by Wells himself, who is assisted in his quest by young female bank teller Amy Robbins. Like Meyer's film, which starred David Warner as the Ripper and Malcolm McDowell as Wells, Warlock benefits from some spot-on casting in the lead male roles. 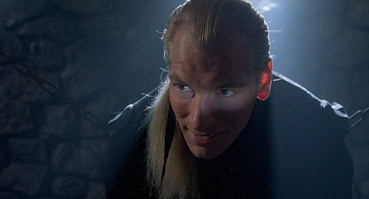 With his gaunt features, self-assurance, suggestive smile and precise delivery, Julian Sands makes the Warlock a figure of intelligence and authority, one well aware of his powers and whose threat comes as much from his imposing demeanour as what he actually does. 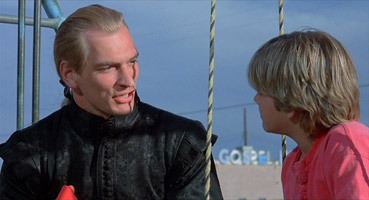 A coldly calculating and amoral creature, he conceals his true purpose behind good looks and faux politeness – even the seemingly friendly exchange he shares with a young boy on a park swing, a sequence that initially seems designed to humanise the Warlock, is revealed to have diabolical purpose. He's matched at every step by Richard E. Grant as Redferne, which while not obvious casting proves a one of of Miner's genuine masterstrokes. Eschewing the glorious eccentricities of his breakthrough roles in Bruce Robinson's Withnail and I and How to Get Ahead in Advertising, Grant plays Redferne like he really has been plucked from the 17th century and charged with the task of saving humanity. Despite the opportunities offered by his broad Scottish accent and archaic English, there are no knowing winks at the audience here – Redferne is a morally pure man with a singular purpose and is not going to be distracted by a movie convention that demands he fall for the girl and find a way to live with her happily ever after. In their shadow somewhat is Lori Singer, who as Kassandra is cast as Redferne's reluctant and sometimes ditzy sidekick and is the nearest the film has to a comedy foil, though is given the film's most amusing lines: "Check this," she mutters to herself after Redferne corrects her driving, "some guy from the seventeenth century teaching me how to drive. How quick they learn." Not everything has dated quite as well. 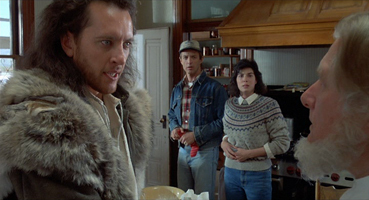 Some of the visual effects are on the ropey side, the chief culprit being the Warlock's ectoplasmic power ray, which has a hand-drawn and animated look that, while not without its charm, kicks against the otherwise strong production values provided by Mad Max lens man David Eggby's crisp cinematography, David Finfer's editing, Jerry Goldsmith's atmospheric score (boy could Goldsmith do horror when required) and Miner's talent for pacing and balancing the generic elements, something he would again demonstrate with aplomb in his witty 1999 monster movie Lake Placid. The graphic violence is sparse and confined largely to the Warlock's early disposal of Chas, and even that has a blackly comic element when his bitten-out tongue is spat into a hot frying pan and match-cut to a pancake meal being prepared at Kassandra's workplace. Even the morally problematic act of killing a child and making a flying potion from his body fat is deftly handled and splashed with black humour – when the boy in question suggests that witches are women who fly on broomsticks, the Warlock crouches down and smilingly informs him, like a children's party magician about to reveal his smartest trick, "I need no broomstick to fly..."
But it's when the film credits the audience with the intelligence to join dots for themselves that it really shines. In what remains after many viewings my favourite sequence, a Mennonite farmer detects the presence of evil through the signs it manifests – soured cream, a sweating horse, bread that doesn't rise – and without an expositional word paints hex mark on his barn. Guided by the witch compass, Redferne sees the mark and bursts into the house, startling the farmer's son but bonding with his father like they've known each other for years. Their introduction is brief and to the point – "The mark is mine" / "Amish?" / "Mennonite" – and the pair shake hands and get straight to work. It's an electrifying moment in which the preservation of ancient knowledge sees three centuries of history effectively cast aside, and in this small but perfectly judged encounter it is we progressive non-believers, not the displaced Redferne or the traditionalist Mennonite, who are the real outsiders. A rather lovely anamorphic 1.85:1 transfer that belies the film's low budget origins (even back in 1989, $7 million was some way short of the Hollywood average) – the contrast is spot on, the sharpness and detail impressive and the colours rich, with naturalistic flesh tones, consistently rich blacks and lively primes. Grain is minimal, there's no obvious edge enhancement and there's hardly a dust spot to be seen – this print has clearly undergone remastering at some point. A very nice job. The Dolby 2.0 stereo may lack the punch of a 5.1 remix, but in terms of clarity and range it delivers the goods, with Jerry Goldsmith's score proving the star of the audio show. Warlock has, I would suggest, garnered enough of a following to justify a small special edition – a commentary involving director Miner and the lead cast members would do nicely, thank you – but there's not a thing on offer here. Even a trailer would be something. A welcome re-release for a fondly remembered fantasy-horror-thriller that, visual effects aside, has hardly aged a day, not least in its economical storytelling and in showcasing its two leading men at close to their best. Second Sight have done really well with the transfer, and it's great to have the film available on UK DVD, but I can't help but ache for the special edition that could have been.